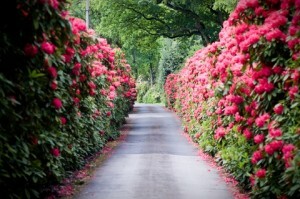 Road lined with the invasive ‘weed’ Rhododendron ponticum. It has been a long time coming. The EU Parliament has finally approved fresh legislation designed to halt the relentless spread of voracious invaders like Japanese Knotweed, disposal of which is a real issue, as well as a host of other creatures and plants. The new rules mean possessing, transporting, selling or growing species the EU thinks are of ‘Union Concern’, will be illegal. And while the baddie list was originally going to be restricted to fifty species, it is now limitless. Having said that, it still isn’t clear which creatures and plants will be banned and which will slip through. The Royal Horticultural Society is apparently positive about the new laws, although they are worried about a lack of clarity regarding the new powers the EU will have as a result. Rhodedendron ponticum, for example, is already included on Schedule 9, Part 2 of the UK’s Wildlife and Countryside Act 1981 (as amended), which makes it a criminal offence to allow it to spread into the countryside. This despite it being the ancestor of more than 300 well-loved garden favourites. You can see why British gardeners are concerned – where, exactly, will the new limits of liability lie? On the bright side, The Department for Environment Food and Rural Affairs has guidelines of its own concerning invaders, and they have given assurances about member states’ flexibility in how they implement the law. It looks like the new rules will be implemented pretty quickly, some say as fast as a few months’ time, with the help of a special deal brokered between member states. Weirdly, the news broke on the same day that the British government criticised existing policy on alien species control as not ‘fit for purpose’. Their criticisms come in the wake of serious threats to biodiversity. The total European cost for controlling non-native species like Japanese Knotweed, demon shrimp and the Harlequin ladybird apparently comes to an astonishing 12 billion Euros a year, an estimated £1 billion a year of which is spent in Britain. The new law will force EU member states to identify exactly how invasive foreign species get into the country in question, and put much better surveillance and monitoring in place. At the same time, EU border checks will be increased and special Action Plans created to more effectively manage existing invaders. It is undoubtedly the most advanced EU-wide approach yet to the problem of alien species, of which there are currently around 12,000 across Europe and 2,000 in Britain alone. But only a few of them are actually invasive and even fewer cause environmental or other kinds of harm… including the truly awful knotweed, enemy of infrastructure and ruiner of natural environments. Watch this space for the new law going live. In the meantime, if you want to find out about Japanese Knotweed control and it’s removal cost, we will be pleased to give you a fair and reasonable quote to get rid of the stuff once and for all.